David Ferreira is standing in the bowels of an active missile silo's control room buried in the craggy expanses of a nondescript mountain range. And he wants you to know he has his finger quivering above the red button. A group of men in sterile white suits and clear face masks flank him as jet boosters on the other side of reinforced plate glass spit out white plumes like a prodded bull's nostrils push out aggravated air. The length and breadth of your experience is at his feet, ready to shatter into fragments that turn into projectiles of their own. All it takes is that push. Is there any better metaphor for Ferreira's uncompromising ability to flay defenses alive? The bottom-line is this. FCD was 3-9-6 without Ferreira in the starting lineup through the first four months of the season. Since Ferreira came back for his first start of the year on July 7 (a scoreless draw against San Jose, a game in which Dez Bryant laid the honorary FCD scarf on Lamar Hunt's bronzed shoulders — It is an occasion to which I'm still trying to attribute the proper significance), he's started every game. FCD is 6-3-4 in those games. What you need to know is that since returning from injury on July 4, he's cinched a pair of industrial-grade winches to FCD's battered flanks, clicked the metallic fiber onto his superhuman exoskeleton and lugged a struggling but talented group through a sludgy mix of quicksand and bone fragments. Whether or not FCD makes the playoffs this year — and make no mistake, Vancouver in the MLS playoffs is the collective nightmare of the country — Ferreira has proven himself to be arguably the most valuable player to his team in the league. Ferreira's impact since he's come back is nearly unprecedented. It is important to understand that the length of time one is injured is almost always proportional to the length of time one requires to return to form. Omar Gonzalez famously destroyed the formula with his return earlier this year. Ferreira has made Omar's comeback look like a comparative eon. Ferreira immediately came back into the role in which he was perhaps the league's best, in the hole behind Schellas Hyndman's rotating striker-of-choice in the 4-4-1-1. He was put there in his first start back and he's been, at least nominally, in that position in each game since. Perhaps the most remarkable bit about Ferreira's explosive role here in the previous several years is that FCD has been flighty, to put it mildly, with its talent up top. It's easy enough to look at a guy like Wondo snagging goals in any way he can find them, something like a crayfish sucking up food from nutrient-deficient soil. Ferreira is the reverse. He is the soil rich in fertility, waiting for a host. Unfortunately, FCD has either lacked it or had it sitting on the shelf with injury. This year has been no exception. Indeed, the last two months have been as instructive a stretch as any, and FCD's talent up top has been as flighty and inconsistent as its ever been. Since coming back to full-time duty, Ferreira has started in an advanced role behind the following in either a 4-4-1-1 or a 4-2-3-1: Scott Sealy (3), Fabian Castillo (3), Blas Perez (2), Ruben Luna (2), Jonathan Top, Jackson and Brek Shea. FCD has won six of those 13 games with seven different strikers cycling through duties up top. Let it be known that the inimitable Scott Sealy, who has already put in more minutes than he has in four years, has more starts than Blas Perez over this span, an injury-riddled striker more or less twice his quality. Fabian Castillo and Brek Shea are both wingers, ideally. And Jonathan Top is 12. The rotation has changed. The strikers have changed. The formation has changed. The only thing that has not over the last 13 games is Ferreira's stable marker spiked down in that attacking third. And this is where things get real. David Ferreira is, taking into consideration his contributions during his fourth season in MLS, the most valuable player to his team in the league. You are free to dispute this and I am free to offer up my reasoning. If Dallas makes the playoffs — and despite the blind percentages playing against it I'd put the possibility of this eventuality at around 50 percent — we will not singlehandedly credit Ferreira's miraculous man-winch, but we will nod knowingly as the diminutive Colombian strides into his first MLS playoffs presser. Because he, perhaps more than anyone, deserves to be there. For anyone who knows Ferreira's machinations well, the following illustration will be wall-dressing. He's been doing this in volume since he was deemed the best player in the league following his exceptional 2010 campaign (eight goals, 13 assists, countless won hearts). But I'd like to take a more clinical look at why exactly Ferreira's drug FCD to the footsteps of the finish line with Vancouver only stretching a bandaged, ugly nose past the Hoops to this point. The first has to come from Ferreira's numbingly efficient performance following FCD's critical 3-2 win over Colorado on Aug. 11. The game marked Ferreira's first goal since April 17, 2011, but it also illustrated his utility in the attacking third, something the Hoops have largely lacked. As Shea has vacillated between positions and been largely ineffective, and the back line has struggled through bouts of injury, Ferreira's return made the attack a focal point again. What I want you to see here is not what Ferreira has done in creation but in his own goal positioning, an area where Ferreira is up near Wondo in his perceptiveness. 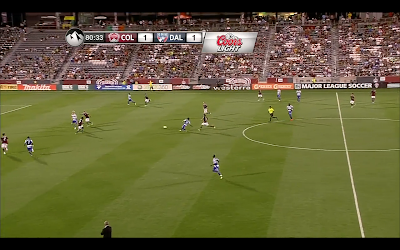 Here you see Fabian Castillo squiggle through the right line and Ferreira perceptively finds his way through a solid hole in the stretched defense. 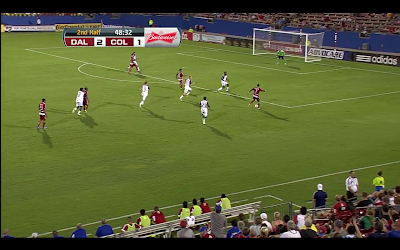 Here we see the split moment before Castillo threads in the pass to Ferreira. This is the kind of positioning that make Wondo and Herc forces as poachers. Ferreira did it instinctively. Take it as you will. The finish was clinical. Ferreira settled with his left, swung through his right and brushed it with the outside of his right foot to Matt Pickens' left. It is easy enough to come to the conclusion that what makes Ferreira so good is his liberalness with possession. He is, by most accounts, an equal opportunity employer. But what makes him that much better is that in these instances when the game is poised on a knife-edge, he's that much more aware than anybody else on the field. He can create, yes. But he can finish, too. The next is a better illustration of his creative capacity, the kind of which we've seen so often over the last few years. To set the scene: 81st minute, July 14th, Colorado and FCD are tied 1-1 and the Hoops are headed dangerously toward a draw they could ill-afford. The first half of the year was so abysmal that by this point, by the time Ferreira came back, the margin for error was so slim that plays like these were utterly essential. I have my doubts that Ferreira played like this, played as though his every move tugged on FCD's marionette strings that keyed the playoff run, but he played as though they did. These kinds of performances when nothing mattered but positive results cannot be understated. So again, all of these pressures in mind, Ferreira commands the middle and sprays this beauty into Carlos Rodriguez on the right wing. The pass was weighted like a 60-pound bell tied around a goomba's ankles. It pulled Rodriguez's trajectory inward beyond his original run. You saw Rodriguez's run, you saw the ball and then you saw Ferreira's intention. It was one of those "Here it comes," not unlike when Neo bounces back up in that dingy hallway, when you knew the opposition was doomed beyond a reasonable doubt. The latter point yanked Rodriguez inside, which drew him inward toward his feed toward his eventual feed on the goal. Dallas won that game 2-1. The instance where Ferreira unlocked the defense was the final straw. So here it is. Ferreira is incomparable in certain respects. There are not many occasions in which you can pinpoint a single player's impact in knocking a team's trajectory either toward the sun's warming orbit or further toward the icy cold expanses of black space. Ferreira's orbital meteor impact has provided the former impetus. Dallas has drifted from its place in the wilds of MLS' regular season obscurity, an utter afterthought, to being on the cusp of something quite impressive. Spread the credit around, but the epicenter of the explosion is David Ferreira. If FCD makes the playoffs, you know where to look. It's also a hilarious bit of irony that this particular spambot, the one commenting on a David Ferreira article, is advertising a business based in Vancouver. It was ironic that this spambot menations Vancouver in a comments section to a post that mentions Vancouver? Do you not know how spambots work?